Arrrrr....git yer hands of me booty! This is the Real de a Ocho. Sometimes referred to as a peso de ocho, or piece of eight. When you get several of them together, they are called 'pieces of eight'. In 1497, Spain went through a reorganization of it's currency, and this Real de a Ocho, (worth 8 reales), was Spain's answer to the popular German Thaler. In the early years, since it had the same value as a Thaler, it was called the Spanish Thaler, or dollar. Durring the time of colonization, the major powers, (England, Spain, The Netherlands), traded with a common currency. 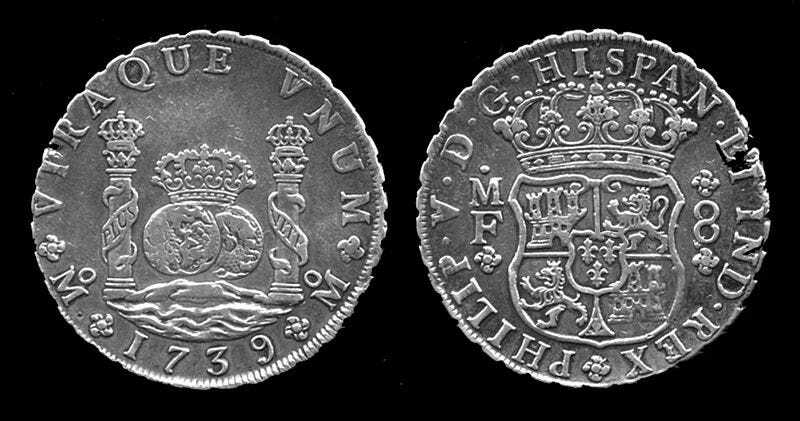 The eight reales coin. And this practice continued in their colonies. For example, the Real de a Ocho was considered legal tender in the US until 1857 when we reformed our own currency. Now, have you ever heard an older person refer to a quarter as two bits? Ever heard the rhyme, "Shave and a hair cut, two bits"? The term 'bit' comes from this coin. Each reales was called a bit. Two bits was....a quarter of the eight reales coin. You also had four bits, (a half), and six bits, (three quarters). Back in colonial time, coins weren't the easiest things to make. And, since these are made from silver, they are fairly soft. So, if you went to the store and bought something for four bits, you handed the merchant your eight reales coin, and he chopped it in half to make change. These coins were commonly divided into eight separate pie shaped wedges for the purposes of making change. After the US changed over to using our own currency exclusively, our quarter dollar was still referred to as two bits, fifty cents was four bits.....you get the idea. But, if you do the math, one bit is worth 12.5 cents. The more observant amongst you will notice we don't have that kind of coin. The US dime is sometimes referred to as 'a short bit', and fifteen cents is 'a long bit'. These terms have fallen out of favor, though, and most people won't know what you're talking about, while most people will know two bits is a quarter. And, in more recent times, a quarter just doesn't buy you much. That's why we refer to something cheap as being 'two bit'. Remember earlier when I said coins were hard to make? Well, maybe I'll tell you about how people used to use postage stamps instead of money, because coins were so scarce.